If you enjoy watching cinema which crawls into your guts to such an extent that it’s impossible not to squirm in your seat, then NYC director Michael Patten’s BADDOG is the perfect uncomfortable short for you. Following the adventures of petty thief and doomed romantic Theo as he stumbles from one ill-conceived encounter to another, it’s near impossible to not find yourself cringing at this hapless oddball. I spoke to Michael about the disturbing incident which set BADDOG in motion and his desire to build fictional films around real-life characters. I’m worried the answer might be yes but was Theo’s character modelled on anyone in particular? What inspired the idea for his New York misadventures? I’ve always been interested in characters living on the fringes of society. Outcasts live in society’s shadows, rejected in ways that reflect the ugliness it hides from itself. So that was my starting point – along with the idea of a compulsive thief who uses a fanny pack. That seemed funny to me. Theo wasn’t based on a specific person, but a particular incident does come to mind. Back when I was an undergrad I went to a house party. I was stoned – most everyone was – and I wandered into a circle of guys laughing at this very drunk, overweight kid who was rocking in place muttering gibberish to himself. Four months later he killed himself. It was pretty unsettling, knowing that I was part of the culture that kept this kid feeling so isolated and alone. That incident definitely influenced BADDOG. For the first half of the film, I think Theo’s absurd and misogynist behavior reads as humorous. And it should! Theo is ridiculous and funny. But as the film winds on and the depth of his desperation becomes apparent, the story takes on a darker hue. 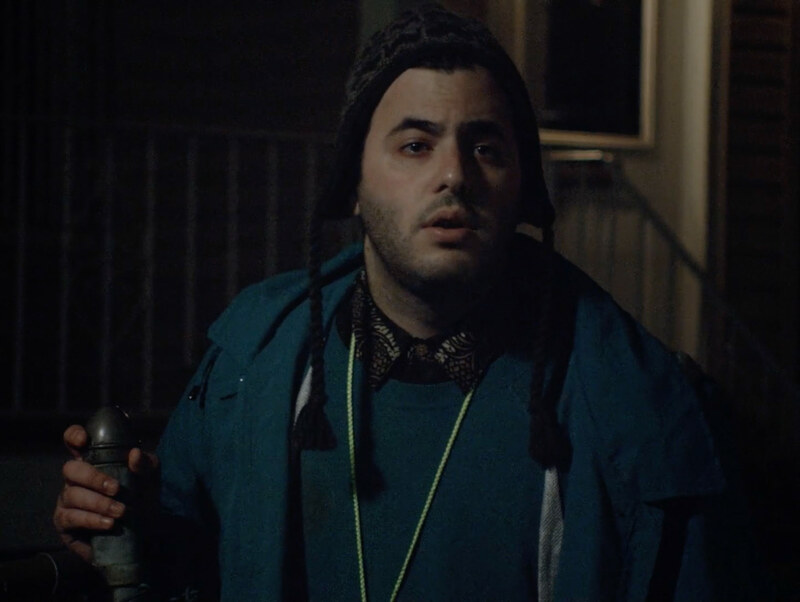 Joshua Simenhoff’s hyped up, jittery performance is perfectly cringe-inducing throughout. Where did you find him and what was the direction that got him to that place? Did he have any reservations about jerking off on camera? Josh is fantastic and I’m glad you agree! This is his first film – he’s a good friend and has never attempted acting before. It was Matt’s idea to approach him. One night we were all playing a board game, and as Josh began to lose, his anger began to bubble up. That was the first clue that maybe this guy could channel some real intensity into the character. It was the first day of shooting, and I remember yelling “Action!” and seeing Josh yank down his pants and go for it. He was an emphatic yes from the moment I approached him. He came to my place and we read through a scene – I played Unk – and it was immediately clear that Josh was right for the role. I think anyone is capable of giving a great performance, actor or non-actor. It just requires a willingness to surrender to the role. And Josh gave all of himself to Theo. I sometimes would send Josh on a lap around the house or block or wherever we were shooting to keep his energy high. And no, Josh had no reservations about jerking off. I don’t remember even having a discussion with him beforehand. It was the first day of shooting, and I remember yelling “Action!” and seeing Josh yank down his pants and go for it. He really brought the magic. You chose to crop the Digital Bolex’s native aspect ratio to 4:3 in post. How did you come to decide that the tighter frame would better serve the story? Sharif and I decided the shooting ratio during our first meeting. We were on the same page straight away. Making that decision helped ground our entire shooting aesthetic – a grainy, 16mm-look, with a seventies edge to it. We shot the whole thing on an old c-mount Angenieux zoom. I remember Sharif saying we should have “Theo fill the frame”. I liked thinking about him being as wide as he is tall. So even when we’d start with the frame wide and open, we’d eventually push in until Theo filled everything. I liked mirroring the drama of the scene like that. By the time Theo was about to explode with energy, often anxiety, we’d be right up in his face. With a 16×9 ratio you would still have those open edges on either side of a face, which might look pretty and all but wasn’t right for our film. Antonio Fernandez’s score provides a hauntingly naked refrain which feels as empty as Theo’s life and sets the tempo perfectly. Were there any specific references you discussed to arrive at this sparse soundtrack? I was listening to a lot of Rahsaan Roland Kirk while writing the film. The guy is an absolute genius. His crazy sax solos felt like a beautiful portrayal of Theo’s lost soul. Then Kevin and I took the three-hour recording and pieced out the most expressive parts. Kevin has some amazing reverb plug-ins. We buried his flute notes under a bunch of filters so it became this moody bed for the sax to play over. We wanted it to sound like a street musician on some alleyway, echoing through the night. I like to think the score evokes a Brooklyn of a by-gone era. Do you have any new projects we should keep an eye out for? I’m really excited about Goodnight, Moon. I’m writing it with one of the smartest people I know – Jacob Kaplan – whose main focus is fiction writing. The movie follows an orphaned young man and a pregnant teen, and after a violent incident with a BB gun, plus a little flirting, they decide to role-play the discovery of the orphan’s dead father. It’s a dark comedy and our eulogy to the fears and denials of growing up and growing old. I’m also in the midst of casting for Tony’s Bedroom. This film follows the tenuous friendship between a runaway kid and a mysterious, and possibly dangerous, older man. 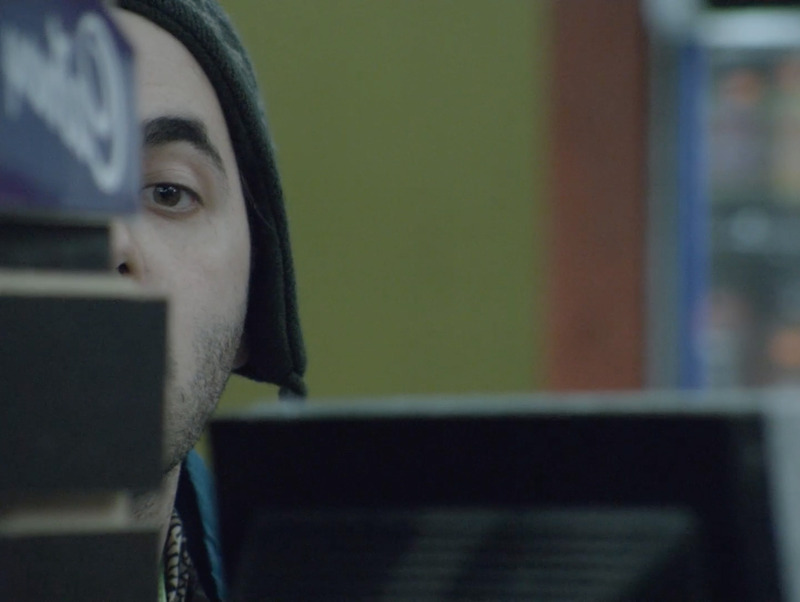 The short was actually inspired by a real-life encounter I had with a slightly predatory older man at a pizza joint. And the best part of all is the older man will be playing himself in the short. It’s definitely a process I’m trying to perfect – finding characters that inspire me, writing a film around that person, and having them play a version of themselves in the film.